Elliptical trainers offer a cardio workout like a treadmill, but without the impact and stress on your lower body joints. When you combine the elliptical leg motion with the movable handles you can also get a full body workout. When shopping for these machines, you want a model that is well built, sturdy, quiet, and has a smooth operation. All these qualities cost increasingly more money for increasing quality. You should also look for resistance and incline adustability to keep you working hard as your fitness level improves. Some other features to watch for include easy-to-use controls, heart rate monitors, preset programs that you will actually use, and the warranty for each model. One important thing to keep in mind is how large elliptical machines are. They can take up a space that is up to 7 feet long by 3 feet wide by over 6 feet tall. There are some models that are designed to have a smaller footprint, but make sure you have the space for the one you plan on buying. 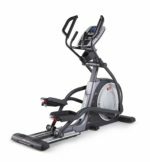 After reviewing dozens of models we could have made our list entirely of ellipticals that cost more than $3000, but we tried to pick models suited for home use from a variety of price points. We also rated the top elliptical machines under $1000. Below is our list of the top 10 best elliptical machines. At the bottom of this list we also provide a comparison chart so you can easily compare the specs of each model. 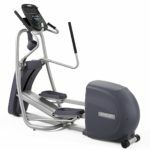 We selected the $4700 Precor EFX 427 Precision Series Elliptical as the best elltiptical machine. 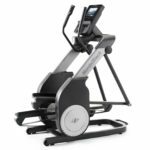 This cross-trainer is built to gym-quality standards and can withstand tons of abuse while being backed up by an outstanding warranty. Plus you get a smooth, quiet operation from the rear drive system. Precor’s ergonomics are second to none and this model has a patented motorized Cross Ramp technology that changes the elevation from 15-40 degrees and thus changes your stride to focus on different muscle groups. The EFX 427 also has 20 resistance levels, 10 preset workouts, 2 user IDs, included chest strap heart rate monitor, and 13 different metrics available during workouts. One unique feature is that the handlebars can convert to a fixed position if you like. 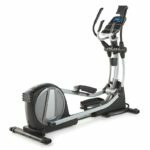 Overall the biggest drawback of the Precor EFX 427 is the huge pricetag, however you will get a high-end machine that will last much longer than lower priced ellipticals. It is also available at Precor.com. Another outstanding elliptical that saves a lot of money over our top choice is the True Performance 300 Elliptical which sells for $3299. This one also has top-tier components and tremendous build quality to give you a club-quality elliptical that should work trouble-free for years. The Performance 300, formerly known as the PS300, uses a center drive system and has a fixed 21-inch stride length. It does not have any incline adjustments which is a bit disappointing, but it does have 25 resistance levels, 12 workouts, and chest-strap compatible heart-rate programs. It is also lacking any way of transferring your workout data to any fitness apps. We recommend the True Performance 300 for daily users who want a durable, long-lasting elliptical and who don’t need any workout fitness apps including iFit. One of the best ellitpicals under $3000 is the Life Fitness E3 Elliptical Cross-Trainer which starts at a price of $2800. Buyers should know that there are two different console options available for the E3 – the cheaper Go Console for $2800 which provides 12 workouts and no app connectivity or the Track Connect console for $3449 which provides 16 workouts and enables Bluetooth connectivity to partner fitness apps. We think that is too much money to upgrade to the Track Connect console. The E3 Cross-Trainer is really well built and uses what Life Fitness calls WhisperStride technology which means it is nearly silent when in use. The rear drive system provides a really natural feeling smooth motion. Other features include a fixed 20-inch stride length, 20 resistance levels, and chest strap heart rate monitoring. Unfortunately there is no incline adjustment. You should consider the Life Fitness E3 Elliptical Cross-Trainer if function and build quality is more important than advanced consoles with app connectivity and you don’t want to pay over $3000. 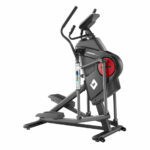 It is also available at LifeFitness.com or Amazon w/ Track Connect Console. 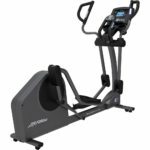 It might not be a typical elliptical machine, but the $2799 NordicTrack FreeStride Trainer FS9i is one of the best fitness machines available for under $3000. 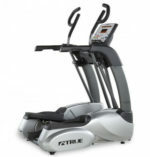 At its core is an auto-adjusting stride length of up to 32 inches which lets the FS9i function as a stepper, elliptical, and a treadmill in one machine. All you have to do is simply change your motion from an up and down movement to a more horizontal running gait to work the way you want. Some other attributes of the FS9i include 400 pound weight capacity, 26 resistance levels, -10° to 10° incline levels, and 38 on-board workouts. The console includes a 10-inch smart HD touchscreen, however you need an iFit membership to take full advantage of. Overall the build quality is not quite on the same level as Precor, True, or Life Fitness. However, the NordicTrack FreeStride Trainer FS9i is still a quality machine which provides users a huge variety of workout options which makes it a good choice for anyone who gets bored easily. 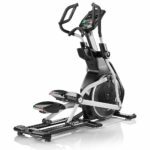 The $2399 True Fitness M30 Elliptical provides a space-efficient home exercise machine with a minimal footprint of approximately four feet by three feet. It is really well constructed with quality components. The M30 features 6 preset workout programs plus a heart rate control workout, 25 resistance levels, and a fixed 21-inch stride length. You can work out your whole body or only your upper body with the use of the side steps. The control panel is pretty simple to use with readouts for time, distance, RPM, HR, work level, Watts, METs, and calories. Its biggest flaw is that it is not very adjustable with a fixed stride length of 21 inches and no incline levels. However, we still highly recommend the True M30 Elliptical for those of you who do not have a lot of space, but want a quality elliptical machine. 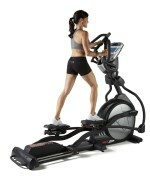 We chose the $1799 Bowflex Results Series BXE216 as the best elliptical machine under $2000. It provides a sturdy build quality with a heavy 35 pound flywheel for smooth, consistent workouts. Some features of the BXE216 include 22-inch stride length, 11 workouts, 25 resistance levels, and up to 15 degree incline. We also really like the console – it has clearly labeled buttons for everything and is very simple to use. It also shows you how many calories you are burning every minute and can sync with the Free Results Series app. Overall the Bowflex Results Series BXE216 is great cardio machine for any moderate user who does not want to spend the money of a top-tier gym-quality model. The Sole Fitness E95 Elliptical Machine provides an excellent value with a price of $1799.99 and could have just as easily been chosen as the best elliptical under $2000. We completely agree with one reviewer on Amazon who stated this machine is steady, smooth, and quiet. It has 6 preset programs, 2 customizable ones, and 2 heart rate programs which can be used with the included heart rate chest strap or the pulse grip monitors. The stride length is a fixed 20 inches, but lengthens a bit with the incline which is adjustable from 0-30 degrees. It also comes with custom articulating pedals to reduce sore toes, ankles, and feet. The blue LCD console displays essential workout data and includes a built-in fan, speakers and water bottle holder. However, the speakers are very weak. It is also available at SoleTreadmills.com. We selected the $1249 NordicTrack Spacesaver SE9i as the best elliptical under $1500. This version combines solid construction with lots of features. One of the best attributes is the vertical spacesaver design which lets you fold up the machine and store in vertically in a footprint of just 32 x 28 inches. Other features include a 7-inch hd display that is iFit compatible, 24 resistance levels, 0 – 10° power adjustable incline, heart rate monitor from grip sensors or chest strap, 30 workout apps, and fan. The biggest problem of the SE9i is the fixed 18-inch stride length. This might be too short for taller people. The brand new $1450 Diamondback 1060Ef is a pretty basic machine without a lot of extra bells and whistles, but it has one important attribute – you can pick one of three settings for the stride length of 18, 20, or 23 inches. It also is completely redesigned compared to other models by doing away with the roller-and-rail design and instead using a dual-spindle technology which better mimics a natural running motion. Other features of the 1060Ef include 16 resistance levels, 12 programs including 4 heart rate controlled plus 4 custom ones, and the ability to go in reverse. The console provides some basic feedback metrics, but is not the easiest to use. Buyers should consider the Diamondback 1060Ef if an adjustable stride length is one of the most important factors for you and you don’t want to spend over $1500. It is also available at Amazon.com. 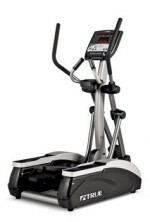 The cheapest elliptical to make our list is the ProForm Pro 12.9 with a price of just $1199. You probably won’t be wowed by this machine, but it is pretty solidly built with a max weight capacity of 350 pounds. The Pro 12.9 has a 20-inch stride length, 0-20 degree incline, 26 resistance levels, chest strap heart rate monitoring, and 35 workout apps. However, to take full advantage of this model you have to subscribe to iFit. We wouldn’t consider the ProForm Pro 12.9 a gym-quality elliptical, but it does provide a good value at this price for anyone who doesn’t want to spend a ton of money.